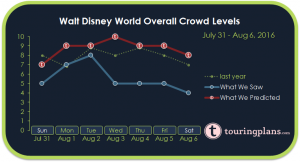 How Crowded Was Disney World Last Week? This year, crowds at Walt Disney World for the first week of August lagged behind historical averages mostly due to inclement weather. Sunday through Tuesday saw crowds a couple points lower than expected while Wednesday through Sunday saw some of the shortest lines we have seen in 2016. 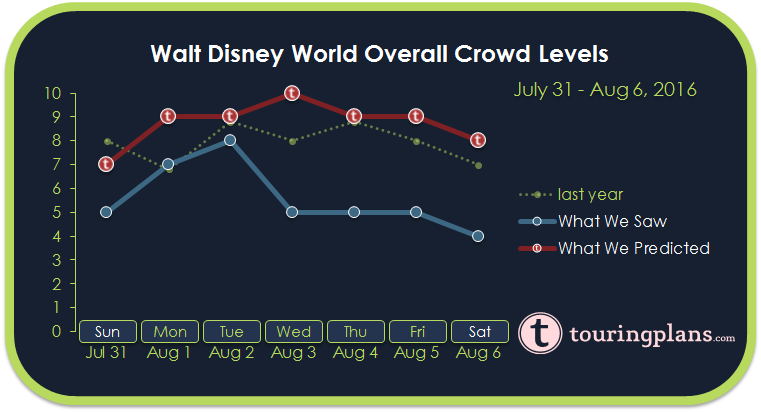 Crowds last year varied between a level ‘7’ and ‘9’ and the Disney World Crowd Calendar predicted slightly higher crowd levels this year. Wait times at Magic Kingdom and Hollywood Studios were within a few minutes of predicted averages on Sunday. Buzz Lightyear’s Space Ranger Spin averaged 33 minutes (predicted 30) and Splash Mountain averaged 43 (48). Crowds at Epcot and Animal Kingdom were much lower than usual for a Sunday in August. Magic Kingdom and Hollywood Studios led the way again on Monday with the two largest crowd levels of the day. Space Mountain had the highest average wait time at Magic Kingdom at 92 minutes while Pirates of the Caribbean averaged 30. Epcot had low average waits at most attractions including Spaceship Earth which averaged 20 minutes (predicted 23). Crowds peaked on Tuesday with all four parks hitting a crowd level of ‘7’ or higher. Magic Kingdom was the most crowded with average wait times like 68 minutes at Peter Pan’s Flight and 79 minutes at Space Mountain. Disney’s Hollywood Studios came in less crowded than expected thanks to averages like 62 minutues at Rock ‘n’ Roller Coaster (predicted 86) and 44 minutes at Tower of Terror (76). Wednesday was the first day of the week where we saw a big dip in attendance. Crowd levels were drastically lower than one would expect for this time of year, mostly due to the weather. Animal Kingdom saw average wait times like 13 minutes at Primeval Whirl and Expedition Everest only averaged 31 minutes. Sparse crowds continued on Thursday with none of the four parks hitting a crowd level above the midpoint in our scale. Last year on the first Thursday of August, Magic Kingdom was a ’10’ and the other three were a ‘7’ or higher. Friday’s crowds were small as well with average wait times such as 42 minutes at Jungle Cruise, 18 minutes at Spaceship Earth, 29 minutes at Star Tours and 27 minutes at Expedition Everest. Saturday’s crowds were the most surprising of the week with Animal Kingdom hitting the highest crowd level of the four parks. Pirates of the Caribbean, Missions: SPACE Orange and The Great Movie Ride all had average wait times half of what the Disney World Crowd Calendar predicted. Weather kept crowds light during the second half of last week, but crowds should be fairly significant as we head into the middle of August. To see Walt Disney World Crowd predictions for the days of your vacation, check the Crowd Calendar. I’ve noticed that your predictions have been really off lately. You can’t really say that inclement weather caused your prediction to be off by 5 points on Wednesday. I’d be willing to accept 1 or 2 points, but a park being predicted as a 10 and ending up as a 5 is highly inaccurate, and can be troubling to someone who relies on your predictions for park visits. I’m beginning to wonder if I can trust Touring Plans anymore for my next trip. Your predictions are starting to be wildly different than other sites, and not anywhere near as accurate. Are you guys doing anything to fix this? I’m curious as well. I really rely on Touring Plans to choose my Disney Days. I would have been over in the parks that week if I saw some of these numbers. I have been an ardent supporter of Touring Plans and their predictions for almost 10 years now, but the trend of being really inaccurate has started to worry me. I can’t even defend them in arguments with users of other trip planning sites due to the recent track record of being so off in their predictions. It doesn’t help that the excuse for being so wrong is “bad weather”. I used Touring Plans for my last trip. I LOVED the site and had tons of fun using their custom plans. Before my trip, I noticed they were usually off by 1 or 2 points. But then I went in May 20-28, and they were off by a lot. My DHS day was predicted as a 3, and end up being a 9!. MK day was suppose to be 6, end up being a 10. That didn’t really ruin my trip, as we had tons of fun anyway, but it makes me wonder If I should rely/recommend the site. The Crowd Calendar is a tool that uses information from the past to offer a prediction for what we are likely to see in the future. Although we do publish the difference between what we predicted and what we observed (and we are the only crowd calendar to do so) we do not purport to offer a crystal ball and the predictions are never guaranteed to be accurate. As with any statistic we have to accept that there will be times when the error is large. The second half of August 2016 is proving to be much less crowded than what we have seen during the same period in the past. That is good news to Disney World guests! I can appreciate that bad weather may seem like a lame excuse but the fact is that, statistically speaking, poor weather has a significant impact on crowds at the parks. When the parks are much less crowded than expected, weather is very often one of the reasons. We try to emphasis that the Crowd Calendar works best in combination with a good touring plan. Use one and the crowds won’t matter nearly as much. I will continue to use the touring plans religiously because they work, but it does seem like I can rely less on the crowd calendar. I planned a trip 6 months out (because you pretty much have to) for September 3-7 based on the predicted low crowds only to have the first part of that changed to some of the highest crowd levels well after making my 60 day fast pass reservations. I realize that new information was received after that, so there is no blame to be assigned necessarily, but that doesn’t change the result that I now have to allocate more time to wait for shows, get through the lunch crowd, etc. 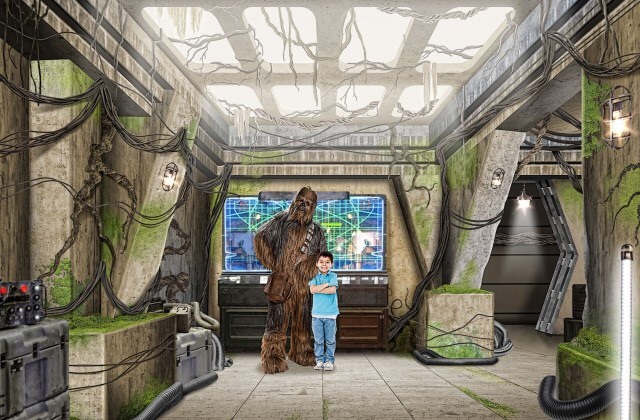 and that it will be far less likely to get additional fastpasses for popular attractions. It’s not the end of the world, but it is a little disappointing. The Crowd Calendar the past couple of years has seemed to rely heavily on the previous year’s crowd levels. Last year the Calendar predicted typically low crowds in September and then crowds surged (and not because the weather was better than the year before). Now this year we get larger crowd predictions for August and September (based on last year’s big crowds) and the crowds just are not there. The bigger crowds predicted may not materialize then, just like that have been lower than predicted this August. In order to create a mathematical model, you have to have data on which to base that model. And we all know that the best predictor of future behavior is…..past behavior! The more data, the better, which is why this site seeks out as much information as they can. But of course there is always error (weather, changes to fast passes, etc. ), so like others have said, arm yourself with a touring plan, use the crowd calendar as a general guide, and be ready for error. We all know that all the careful planning in the world is subject to the unknown (kids get sick, rides break down). You will have a great time regardless!